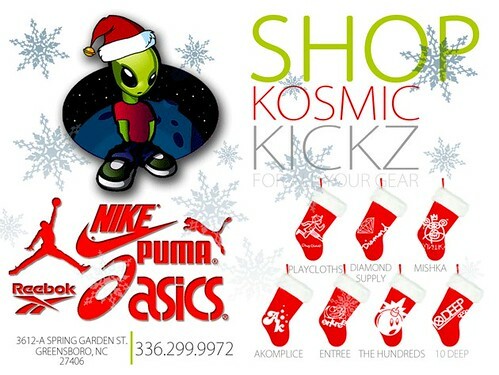 Shop Kosmic Kickz (@KosmicKickz) Annual Holiday Sale Now Thru January 1, 2013!! Today Kosmic Kickz begins their huge annual holiday sale!! The many specials includes 20-40% off select merchandise. The sale continues until January 1, 2013. Their sneaker boutique includes many rare and exclusive shoes you will not find anywhere else in North Carolina! Nanci O Is Hip Hop T shirts can also be purchased at Kosmic Kickz as well as the in the online store. Always remember the impact and significance of supporting area businesses by shopping locally!! This entry was posted in Fashion, Holiday, News, The Local Buzz and tagged Kosmic Kickz, Nanci O Is Hip Hop. Bookmark the permalink.